Yes, you read that figure correctly. Six digits and the first one started with a seven. That’s quite a lot of money to throw around for an old car… but then again, this is no average Mercedes. It’s in fact one of the most hallowed vehicles to ever roll off the company’s production line, a 1990 Mercedes-Benz 190e 2.5-16 Evolution II. Its name may be long but its purpose – as seen by its no-nonsense styling – couldn’t be more concise. The ‘Evo II’ was a race-bred road car, one of only 502 to ever exist, and if you have enough pocket change lying around, you can claim this extremely rare example located in Fort Lauderdale, Florida. While it has been said before, if ever there were a competition for a spot in Darth Vader’s garage… this would surely finish at the top. The 190e Evo II was born out of DTM racing homologation regulations, which necessitated 500 road cars be built in order to obtain race legality. Mercedes duly complied and gave the Evo II its most recognizable feature, its styling. Out came the pumped-up fender flares, low-slung adjustable suspension, racy wheels, imposing front bumper and towering rear wing. These were looks that could kill, and it had the power to back them up. 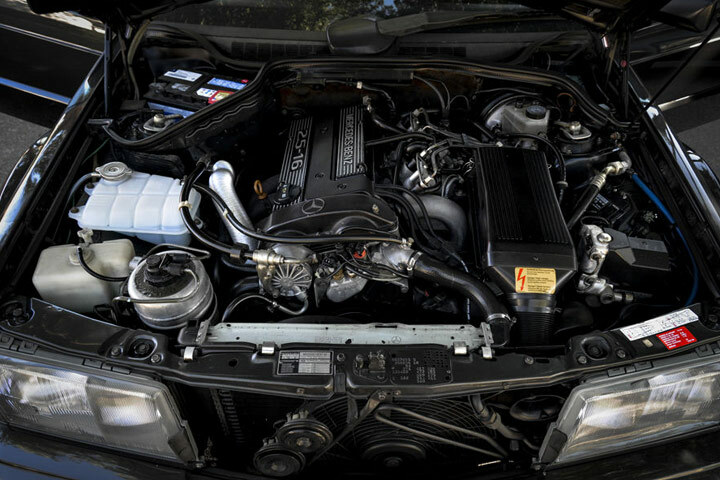 Under the hood, the Evo II packed a 2.5-liter Cosworth-tuned engine, which generated 235 horsepower and a sizable leap over its predecessor’s 195hp. Zero to 60mph was disposed of in 7.1 seconds, but true performance was observed in the bends where the close-ratio five-speed gearbox could put the Evo II on the power in a hurry. This car in particular is claimed to be the 146th Mercedes 190e Evolution II produced, a claim reinforced by the build count located on the gear knob. Given that this homologation special was never intended for the US market, the seller of this Evo II waited until the car’s 25th birthday earlier this year in order to skirt tricky importation issues. Overall, the Mercedes looks highly original with only 80,000 miles on the clock, and a number of interesting optional extras, which include a power sunroof and leather-cloth sports seats. The standard 190e sedans tend to trade for just a few thousand dollars online. Given their low production volume, the Evo IIs are more or less unobtainium… then again that notion is reflected in the $700,000 asking price.